Harrison Jacobs/Business InsiderThe author at the Great Wall of China. The Great Wall of China became one of the 7 New Wonders of the World when it was chosen in 2007 by a vote of 100 million people. 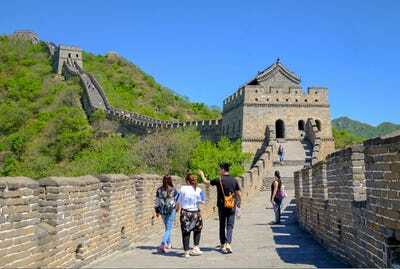 The Great Wall may be one of the most iconic man-made structures in the world and is a must-see for most travellers. There are many places to see the 13,000+ mile (21,000km) long wall. 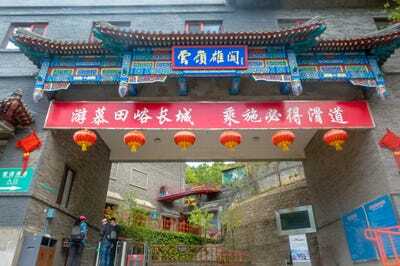 I decided to visit a section called Mutianyu about 2 hours outside of Beijing. 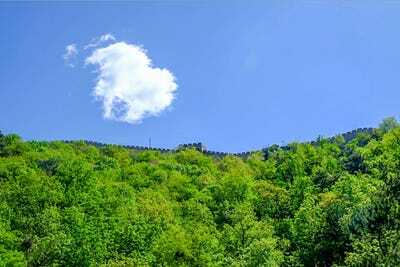 Located in a picturesque verdant valley, the Wall was beautiful and, on a spring day in May, there was perfect weather and few crowds. 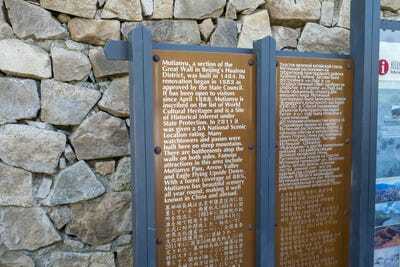 I can’t wait to visit wilder sections of the Wall on later trips. 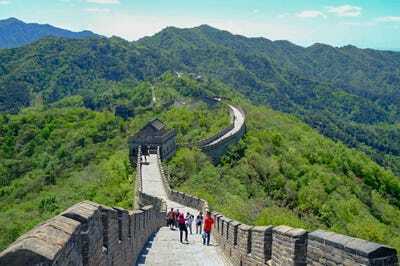 While only one of the ancient seven wonders of the world still stands – the Pyramids of Giza – 100 million people voted in 2007 to select a New Seven Wonders of the World.  Among the winners: the ancient city of Petra in Jordan, the Christ the Redeemer Statue in Brazil, Machu Picchu in Peru, Chichen Itza in Mexico, the Colosseum in Rome, and the Taj Mahal in India. 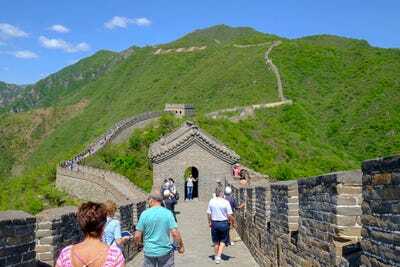 Though the Great Wall was not listed as World Heritage site by UNESCO until 1987, it is possibly the most iconic man-made structure in the world. 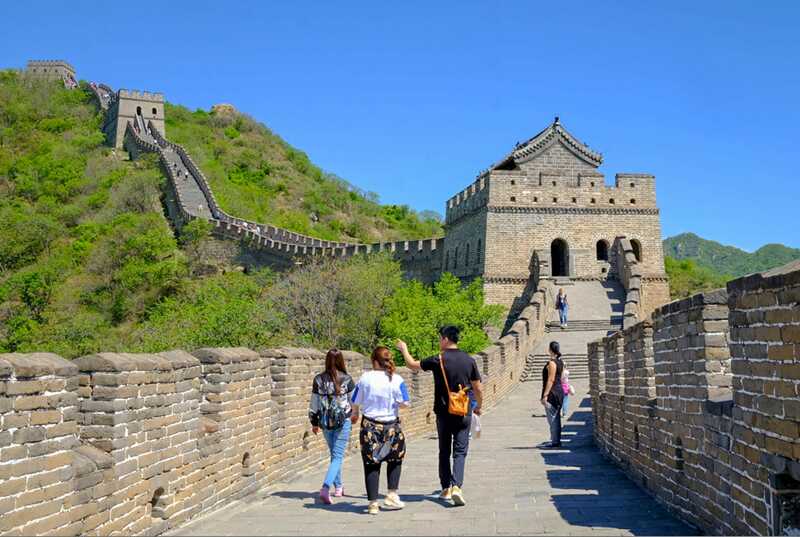 I don’t think it’s an exaggeration to say it is a must-see for just about every traveller with even a passing interest in seeing China. 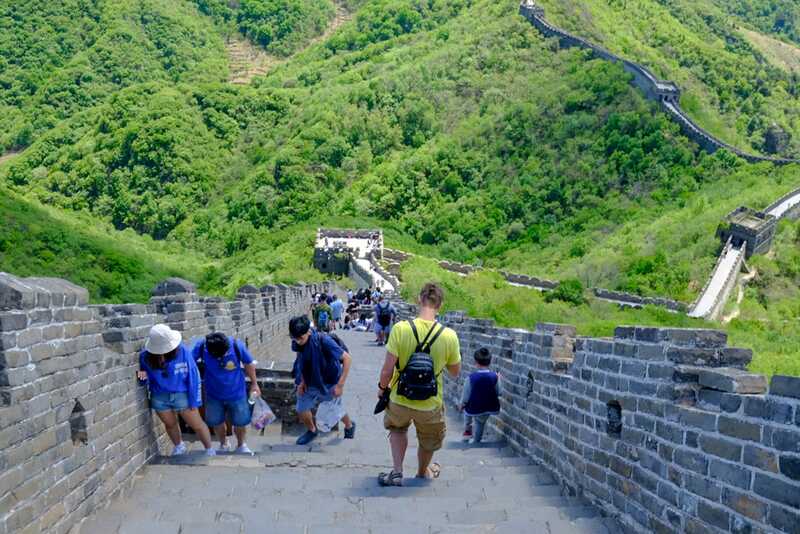 Visiting the Wall can be easy or hard depending on what exactly you want to see. Stretching over 13,000 miles through mountains, grasslands, and deserts, there are lots of places to see The Great Wall. It all depends on how much time you have and what you want to see. When I visited China in April, I was on a tight schedule that had me running from Shanghai to Beijing to Shenzhen for a slew of meetings with tech companies. 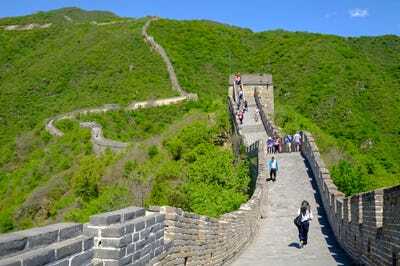 It left me little time to traverse the wilder sections of the Great Wall. But there was no way I was going to miss a chance to see the wonder. I decided to visit the Mutianyu section of the Wall, just a couple hours outside of Beijing. Located in a picturesque green valley, the well-maintained section is one of the most popular places to walk the Wall. It was the perfect trip to see 3,000-years worth of history in a single day. 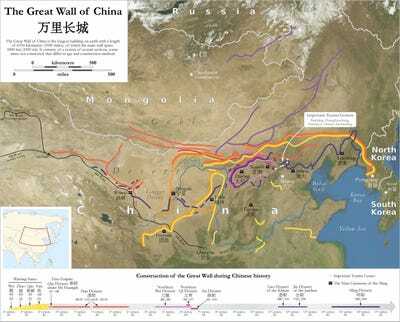 While most people tend to think of The Great Wall as one giant thing, it’s actually a series of sometimes connected, sometimes independent fortifications built along China’s historical northern border. 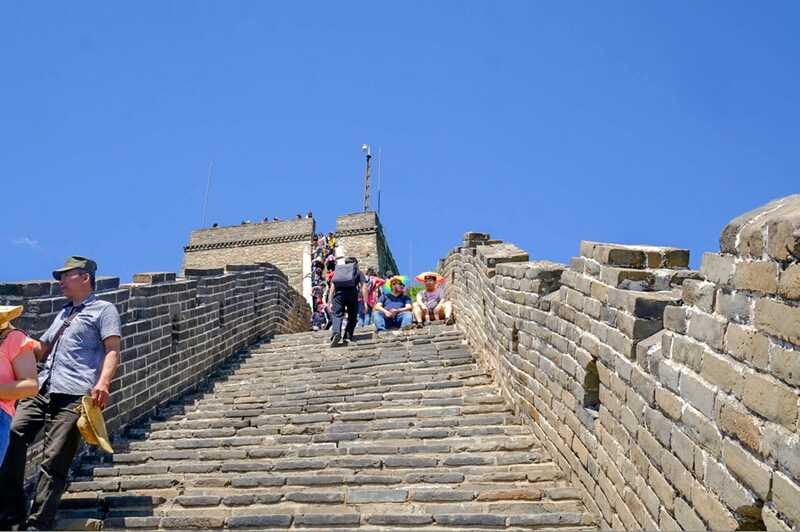 There are any number of sections to visit, but the most popular tend to be those within a few hours of Beijing. 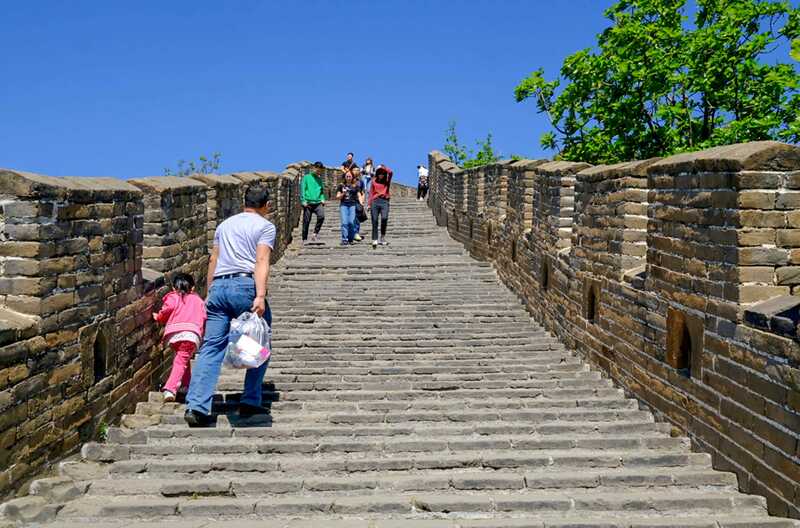 The Badaling section, the closest to Beijing is easy to walk but very crowded, while the Simatai section is further away, quiet, unrestored, and requires a difficult hike. The Mutianyu section is somewhere in between those two. 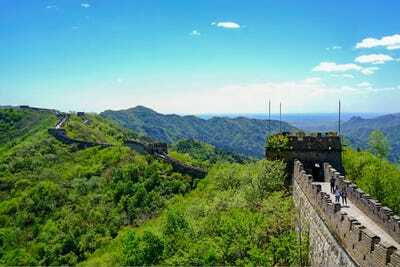 After about a two-hour drive north from Beijing, I arrived at the Mutianyu section of the Great Wall. 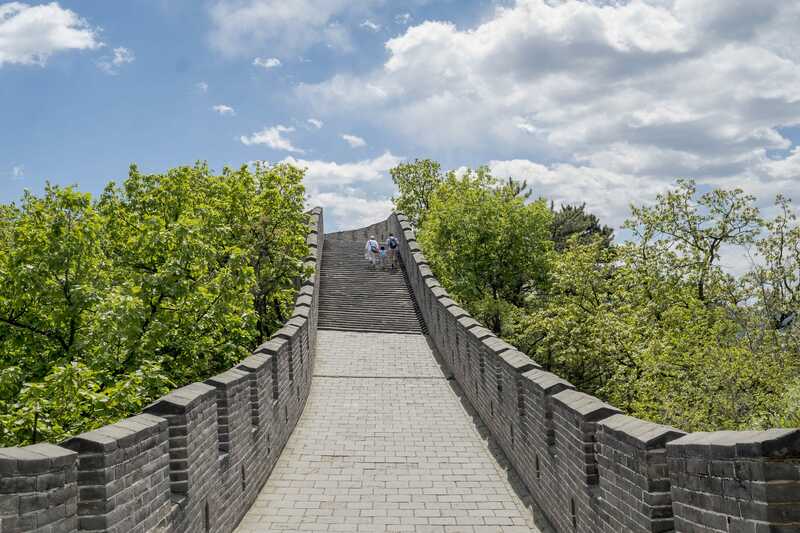 There’s a big paifang, or Chinese gateway arch, to let you know you’re in the right place. 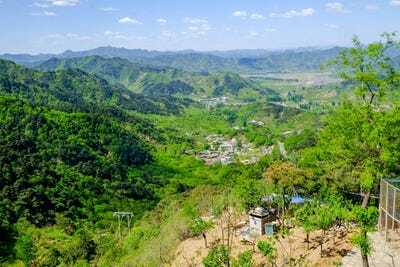 The Mutianyu section extends for about 3.4 very hilly miles, with a series of gatehouses and watchtowers along the way. 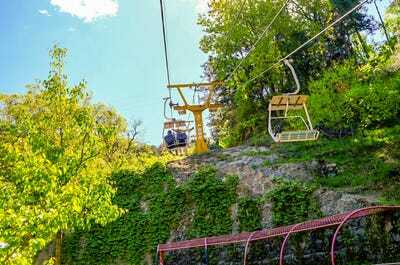 A ticket to the park costs only about $US6, but there are additional fees if you want to make things easier on yourself, like using the cable car. 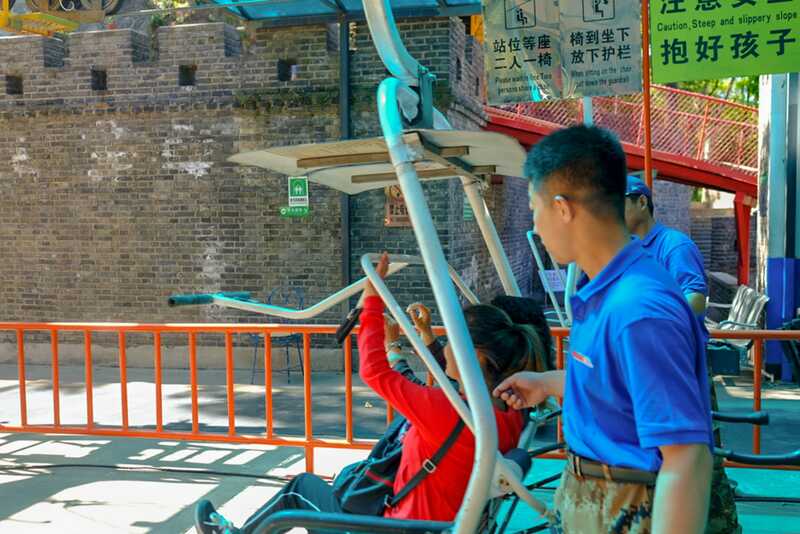 I decided to take the cable car to the Wall. At $US15 one way, it wasn’t cheap. But, as I was only there for the day, I wanted to make sure I got as much time as possible to explore the Wall. It’s not every day you get to see one of the wonders of the world. 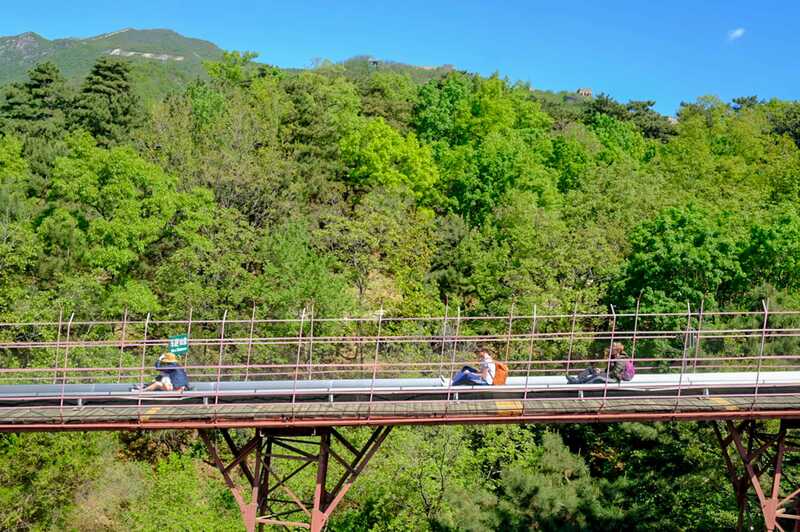 Those afraid of heights, however, may want to make the journey up the mountain on foot. 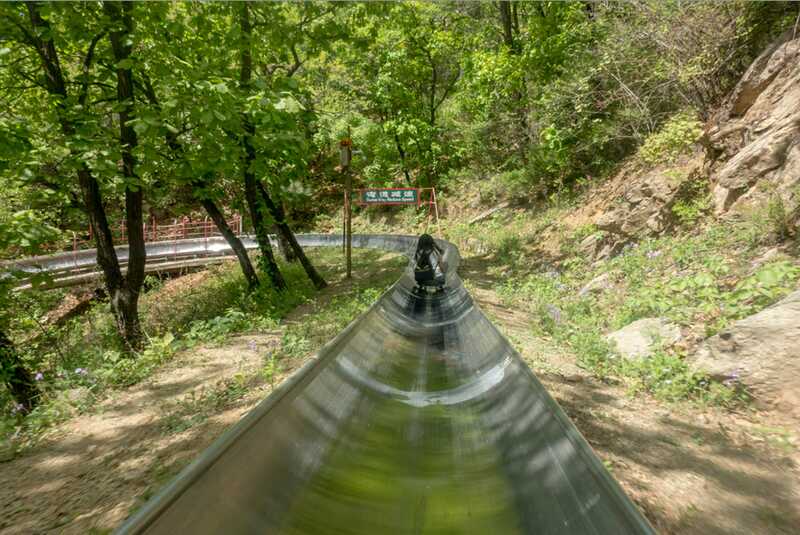 As the cable-car rises, I got a look at the toboggan slide that you can take down from the Great Wall. It looked like a ton of fun. 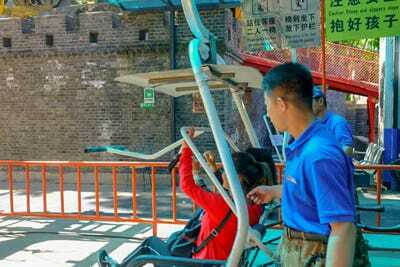 As the cable car rose to the top, I got my first glance at the Wall’s silhouette. The cable car drops you at Watchtower 14. 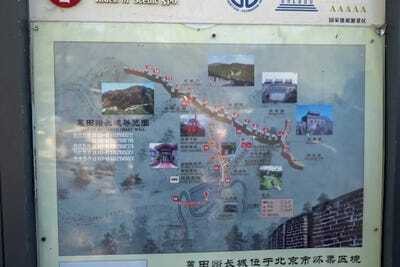 There are 23 watchtowers in total along the Mutianyu section. The section of the wall towards Watchtower 1 snakes over the mountain through the lush greenery like a dragon’s tail. 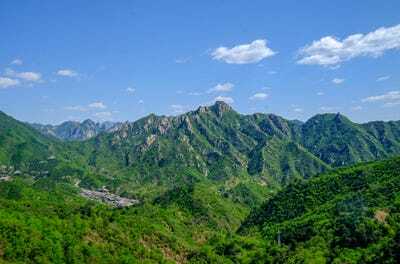 From on top of the wall, I could see down towards Mutianyu Village in the valley. While the Great Wall was started around 200 B.C.E by Qin Shi Huang, the first emperor of the Qin Dynasty, it was continuously built by successive dynasties over the next 2,000 years. Different sections, therefore, were built at different times and using different materials and building styles. 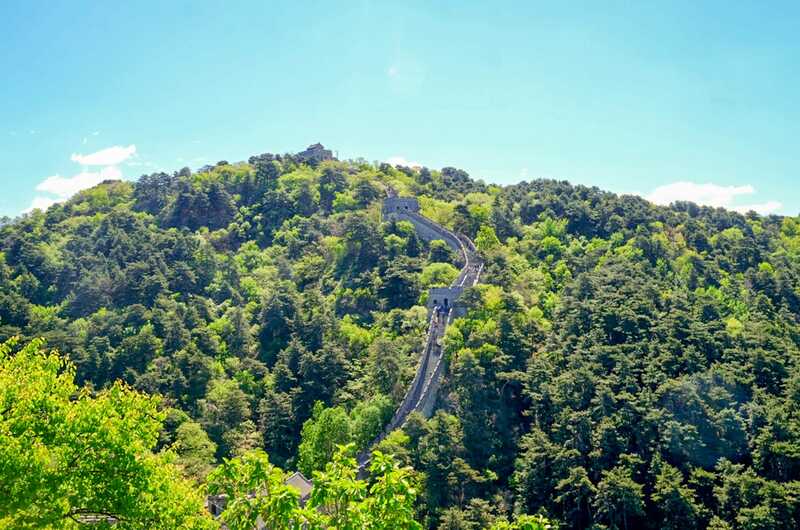 The Mutianyu section was first built during the Qi Dynasty, around 550 C.E. 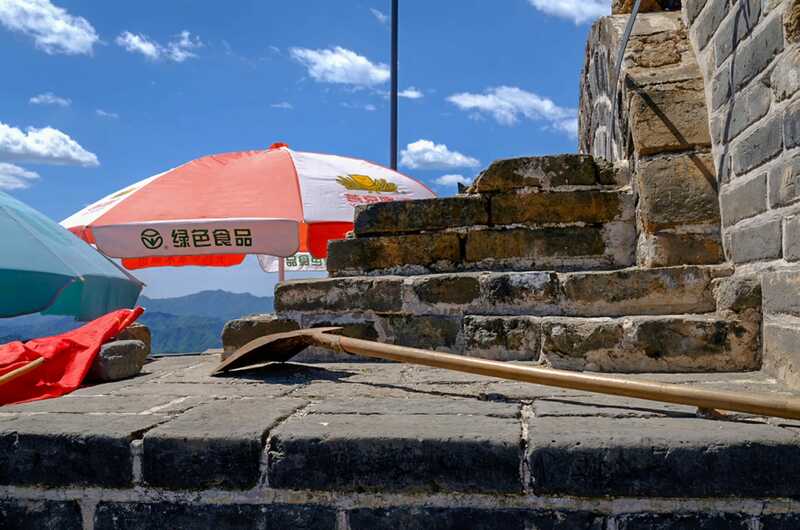 and then rebuilt during the Ming Dynasty in the late 1300s. 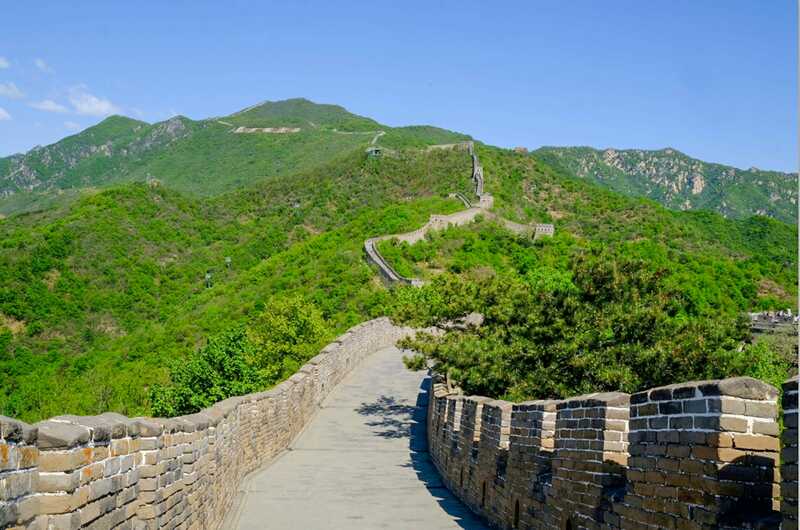 The Mutianyu wall is made primarily of slabs of granite and measuring about 23 to 26 feet in height. 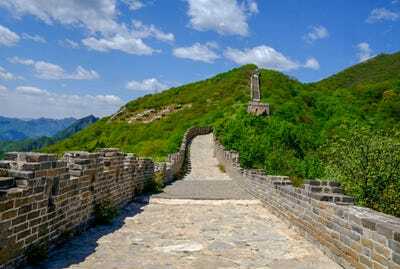 Other sections were made of stone, brick, earth, and even wood. 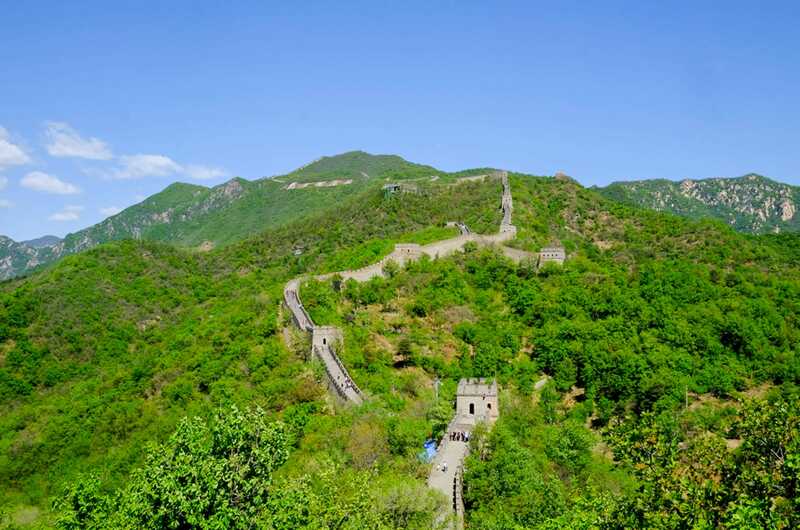 For contrast, take a look at the Jinshaling section of the Great Wall. 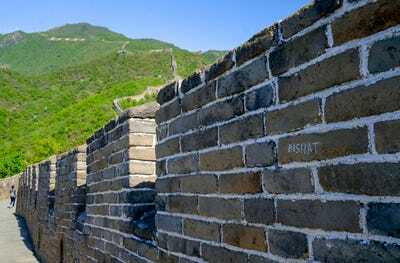 Though just a couple hours northeast of Mutianyu, the Jinshaling wall has a completely different building style with many watchtowers made of brick and even wood. It was originally built during the Ming Dynasty in the late 1300s but was rebuilt 200 years later. 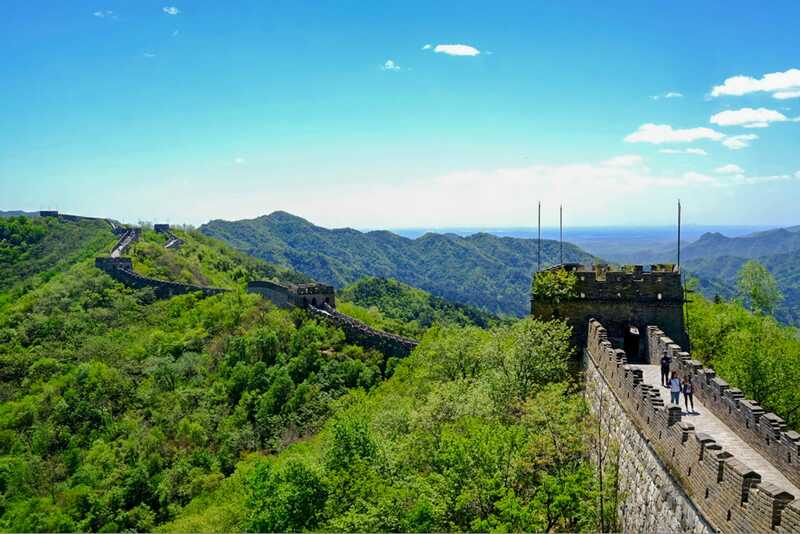 Jakub Hałun/Wikimedia CommonsThe Great Wall of China. 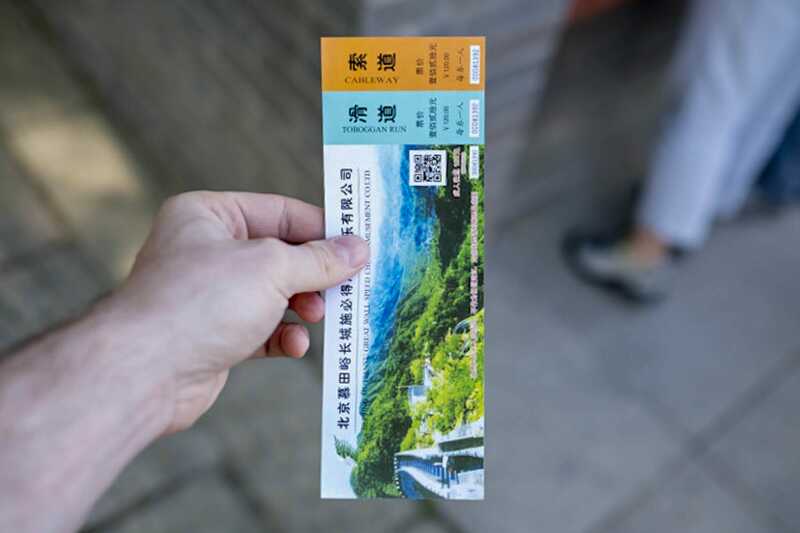 My guide warned me that few people have enough time to get as far as Watchtower 19. Challenge accepted. …followed by gently descending slopes that follow the curvature of the mountains. 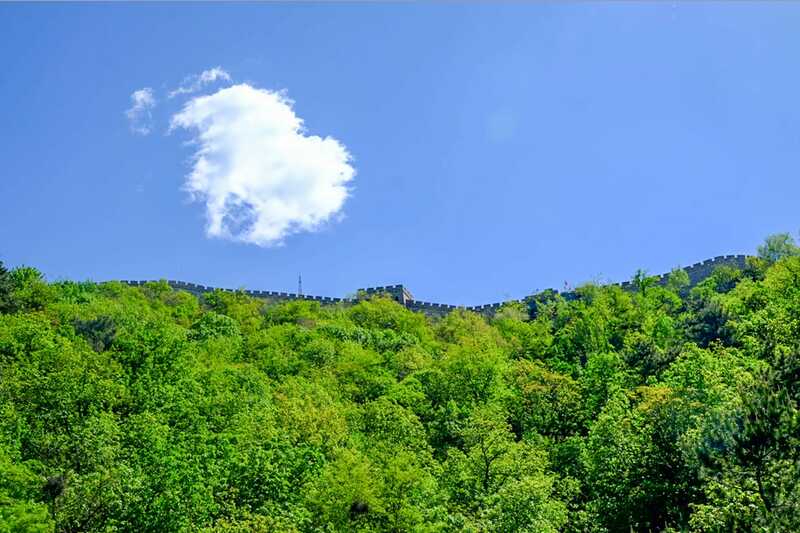 Though you can visit the Great Wall any time of the year, the spring is a spectacular time to visit Mutianyu. I visited in early May. The sky was clear and blue and the weather breezy and cool. While the Great Wall can be photographed from space, contrary to popular belief, it cannot be seen with the naked eye from space. I learned that while reading Wikipedia as I walked. There is surprisingly good cell connection up there. One of the best and worst parts about the Mutianyu section of the wall is that it is completely exposed to the elements. Even on a nice cool day, like when I visited, the sun is bearing down on you. 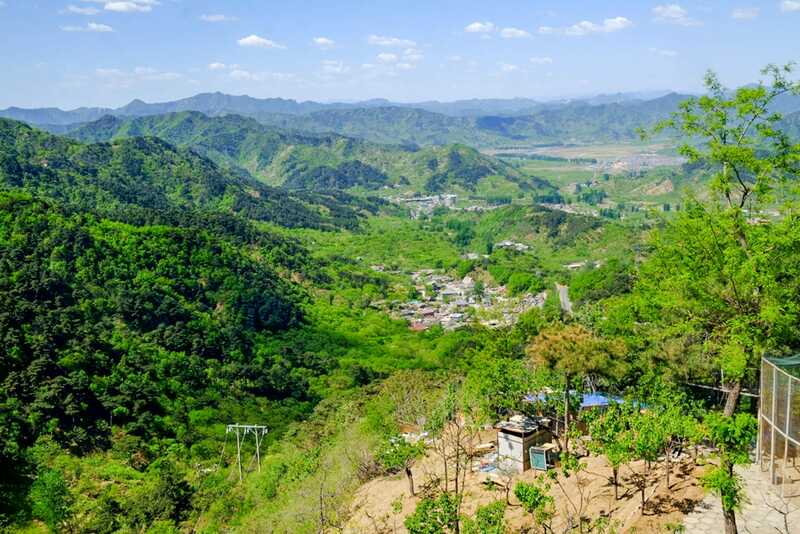 I can’t imagine visiting in the peak of summer or winter. As I zeroed in on Watchtower 19, the path grew practically vertical. The two visitors on the right had the best idea with those rainbow-coloured hat-umbrellas. Just when I had ascended that near-vertical stairway and came to a platform where vendors were hawking refreshments, there was another near vertical staircase to climb. 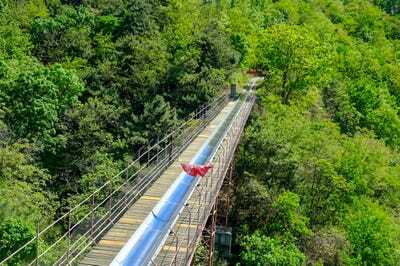 This last section was the most dangerous of them all. 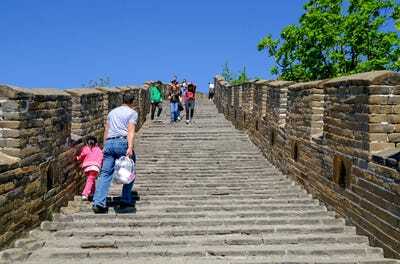 Semi-dilapidated, it required you to actually climb it on hands and knees to reach the final section of Mutianyu. But the short climb was worth it. Most people don’t go past the landing below so the section above was serene and devoid of people. Making it back down was perhaps even more harrowing and tiring than the way up. One wrong step and I’d tumble down the stairs like a slinky. Though there are tons of different sections of the Great Wall you can visit, the Mutianyu and Badaling sections alone draw over 10 million visitors a year. 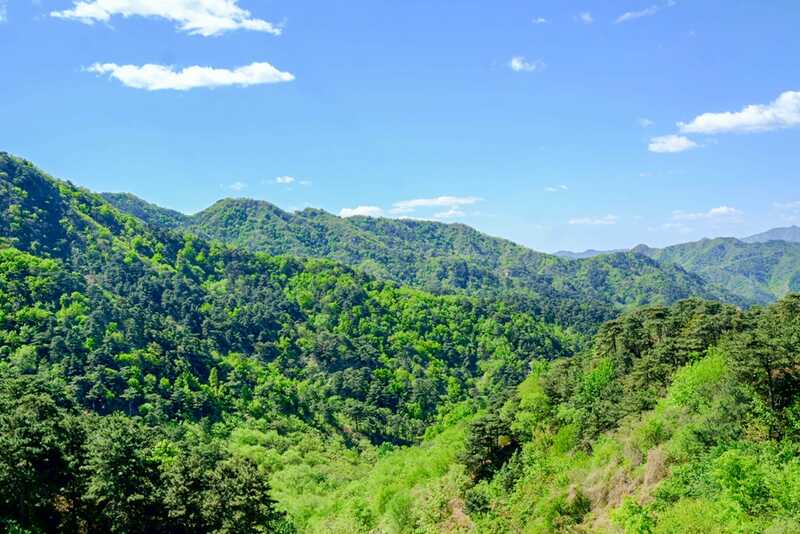 The stunning landscape must be a big reason why. 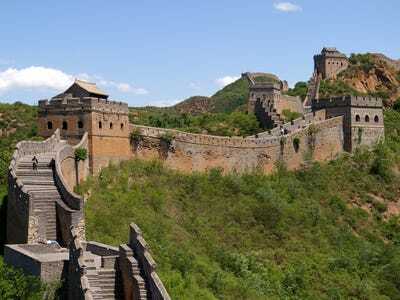 It’s very much what I pictured the Great Wall looking like. 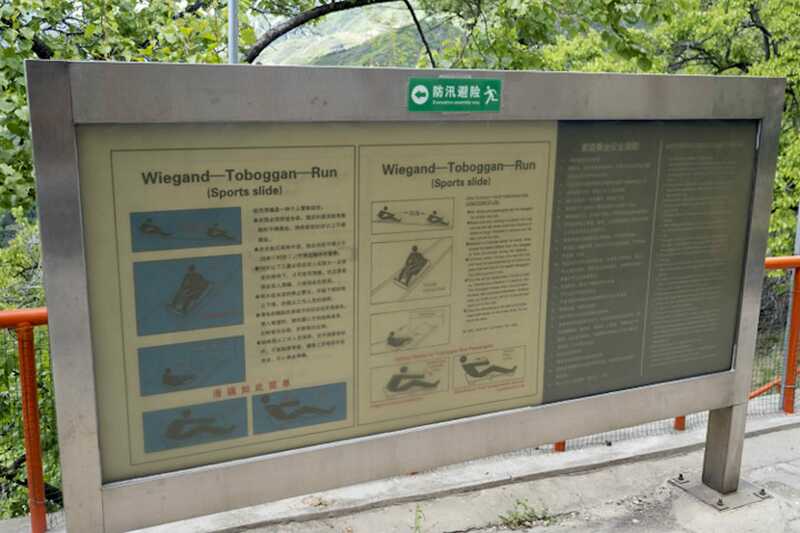 An added bonus of the Mutianyu section is that if you are tired of walking, you can take the toboggan down for an extra $US15. I’m a sucker. I took it. I’ve never done a toboggan or an alpine slide before. 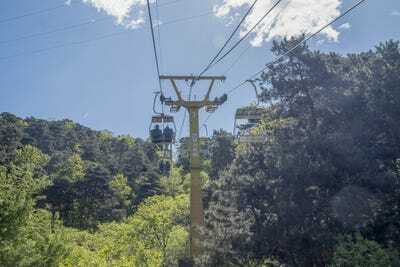 Don’t tell the Chinese government, but I broke many of the rules, including carrying a camera and moderating your speed. 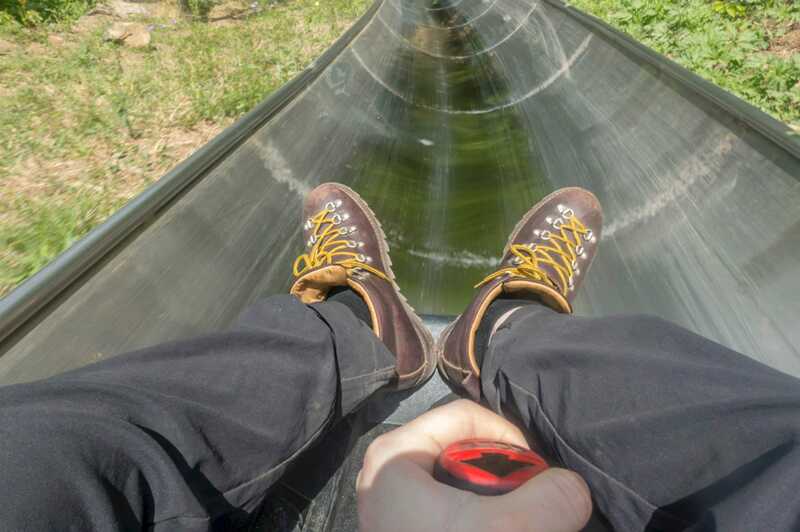 It was a pretty spectacular way to enjoy the landscape for a little longer. But this flat section slowed me down quite a bit. 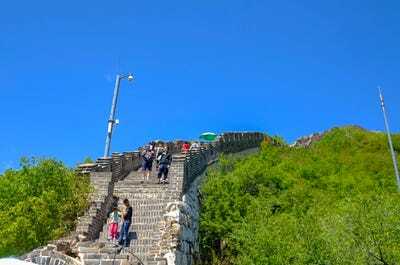 Mutianyu was the perfect way to see the Great Wall if you are only looking to do a day trip. But after seeing the magnificence of the Wall, I’d like to visit other less-travelled sections. 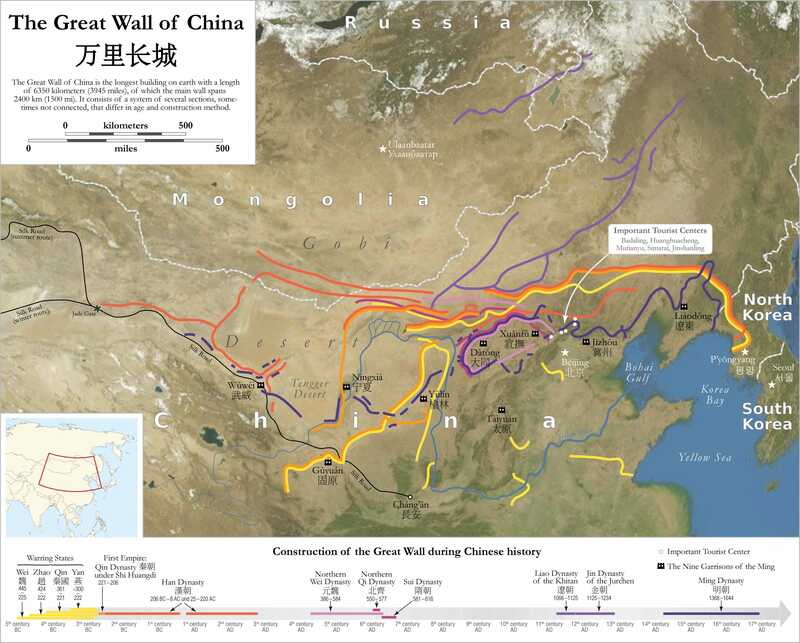 Parts of the Wall extend through more than a dozen Chinese provinces and all kinds of landscapes. There’s always more to see.